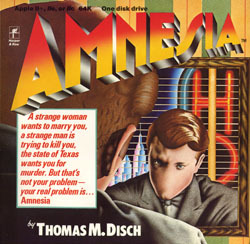 Amnesia is a text adventure written in the mid-1980s by science-fiction author Thomas M. Disch. The game was released by Electronic Arts in 1986 for the Apple II and MS-DOS machines - a C-64 version followed shortly. The game was originally supposed to be released by book publisher Harper & Row; however, the Harper & Row version was cancelled and the project was picked up by Electronic Arts. Unknown to most, Harper & Row produced the game packaging, which features a completely different set of illustrations than the commonly-seen Electronic Arts version. In the fall fall of 2008, I accidentally came across this packaging and purchased it from a rare books dealer - as well as a copy of the original manuscript for the game, which you can also find on the site.